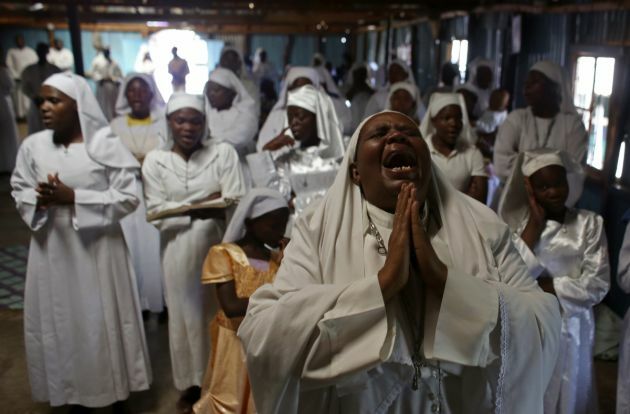 (Photo: REUTERS / Goran Tomasevic)A woman prays inside a church during a prayer for victims of last week's shooting attack at Westgate shopping centre, at a Kibera slum in Nairobi September 29, 2013. Kenyan authorities are holding eight people in connection with an attack by Islamist militants on the Nairobi shopping mall and have released three others after the assault that killed 67 civilians and soldiers, the interior minister said on Friday. Somali Islamist group al Shabaab said Saturday's attack, which ended after a four-day siege by soldiers and police, was "just the premiere of Act 1" and suggested it would be followed by other actions by its "warriors". A convert living in Nairobi's Eastleigh neighborhood has been thrown from a fourth floor balcony after Muslims learned that he left Islam for his Christian faith. Mohammed Ali, a 30-year-old convert from Islam, is now recovering but is still in a critical condition in a Kenyan hospital, Morning Star News reported. "Mohammed left Eastleigh six years ago after escaping an attack," said his wife, who also fears for her security. "I had been telling him to be careful of the Muslims at Eastleigh, as they are not happy with his conversion to Christianity." Ali was with a friend when the incident happened on August 15. They were inside the house when five men reportedly said they were searching for Mohammed. The men were said to have pushed their way in, pulled Ali out of the room and threw him over the balcony. According to Morning Star, Ali is said to be suffering from memory loss and speech impairment because of the incident. "I just found myself in the hospital bed," Ali said. "How I got into the hospital, I do not know." A doctor at the Kenyatta National Hospital where Ali is confined said that Ali's bladder was injured. A deep wound was also seen in his stomach indicating that he had been slashed with a knife. Ali's wife believes that the whole incident was planned and the Muslims really tried to kill him. "My husband left the house and did not come back, and that very day I received a telephone call from the police informing me that Mohammed had been attacked," his wife said. His wife is also worried with the rising hospital bill amounting to $1,110. "I am appealing to well-wishers to help us settle the hospital bill as well as support us at this trying moment," she said. Ali has served as a Bible teacher and discipleship mentor for the Somali church in Nairobi. He became a Christian 15 years ago. Religious persecution has been prevalent in Nairobi. Underground Somali churches cannot worship openly as leaving Islam is a crime punishable by death in Somalia. Last year, terrorists targeted Christians in Nairobi Mall taking hostages, killing more than 62 and injuring 175 shoppers. According to Operation World, Kenya is 83 percent Christian while 8 percent of its 45 million people are Muslim.